Want to listen instead of read this post? Now you can! I write to you today, friend, with a bittersweet heart. My social media summer sabbatical has come to an end. Like the long days of summer, filled with slow mornings, afternoons splashing in the water, and evenings outdoors way past bedtime, this sabbatical has been a time to press pause from the routine. I've learned that pressing pause has allowed me freedom to play. Play with my schedule, play with my dreams, play with my people. There hasn't been a fear of being good enough, keeping up, or failure, instead, there has been a constant hum of grace. Grace has ushered me into an unhurried state, has welcomed me into her arms of rest, and continues to tell me that it's okay that I didn't complete the tasks on my to-do list today. Grace is not a production, it's an altar call. Grace has been given to me, and for the first time, in a really long time, I've received it. Being away from social media this summer is what began my sabbatical but now I can see that this action has opened the door to a way of living that seemed almost foreign to me in the past. Taking a break from posting online was the first step for me this summer to "un-busy" myself. Busyness has been my mantra for majority of my life, and my days have been so filled with productivity that I've lost the feeling of simply being in the presence of Christ. All these years, my intent has been for my work to glorify the Lord but I've continually fallen into seasons of fatigue because I haven't accepted the gift of Sabbath as part of my weekly routine. I write to you today because now I know what I've been missing and I'm afraid to go back. I'm afraid for my family to trade the slower rhythm of summer for the early mornings and busy fall evenings. I'm scared that I'm about to be sucked into a schedule that has no margin and I don't feel like I can breathe. I'm anticipating exhaustion - mentally and physically - and short tempers from me and my children as we adjust our bodies and schedules to a new routine. My mind is already looking at the month of August as a whole that I've lost sight of what God has called me to today. But, still in the haste, I hear the hum of Grace. Grace says, "Perfect love casts out fear. Come to me, all of you who are weary, and I will give you rest. I will lead you beside still waters and bring you comfort." The Sabbath was made for man and can be found in Jesus. Sabbath is part of the creation story, what God did on the seventh day not because He needed rest but to model a behavior of rest to us, His chosen and loved people. While my sabbatical has been an extended break over the summer, my hope is to continue this action of pressing pause once a week as my family transitions out of summer and into our fall schedule. Even though my sabbatical has come to an end, I look forward to receiving the gift of Sabbath in the weeks ahead. This, my friend, gives me much comfort and hope for the next season of living. Our family has fallen in love with audiobooks this summer and stories in the evening. Instead of scrolling Instagram while sitting at a stop light (horrible to admit, I know! ), we have been captivated by story. Some of our favorites this summer have been Little House in the Big Woods, Stuart Little, and A Bear called Paddington. When I haven't been with my kids, I've enjoyed talking on Voxer with my writing friends and listening to the How I Built This podcast from NPR (The episode where the interviewed the Chicken Salad Chick owner was amazing!) At night, we've enjoyed reading A Bear Called Winnie, The Magician's Nephew, and If You Give a Moose a Muffin. On a personal note, I've taken this break as a time to learn new things and have enjoyed thumbing through Floret Farm's Cut Flower Garden and Michael Pollen's In Defense of Food. For the beach, I enjoyed finishing up the Me Before You series by reading Still Me and really was moved by Kristin Hannah's newest, The Great Alone. I've tried to finish The White Queen but it hasn't really captivated me as much as I thought so I think I'm about to move on to Emily Giffin's new book All We Ever Wanted. Reading has been a great adventure for our family this summer and something we can enjoy together or alone. 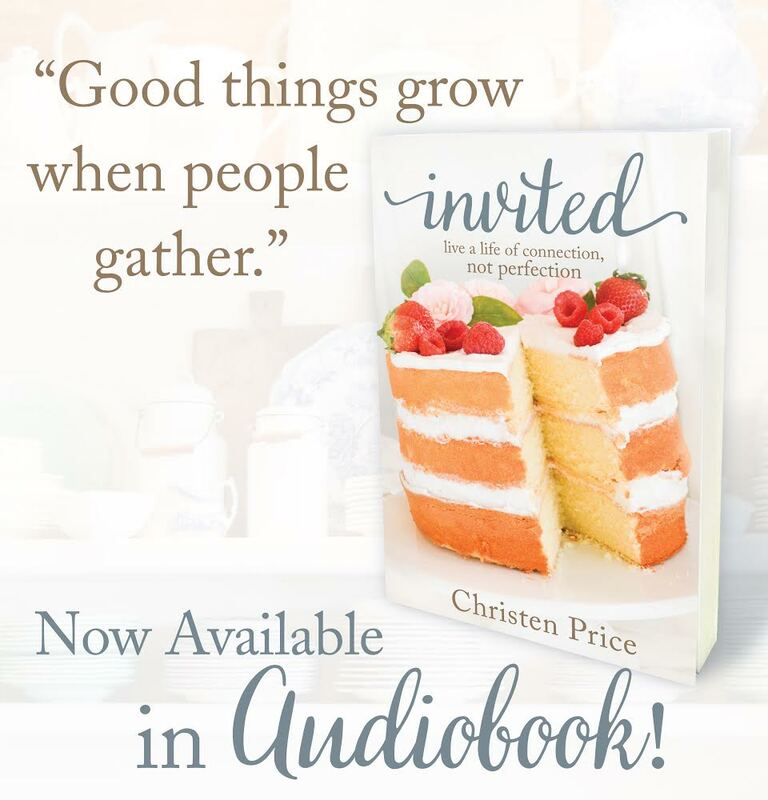 Invited is now available as an audiobook! Get it for free on Audible here. One of the things our family enjoys to do the most in the summer is to pick blueberries in our backyard. Every year, God blesses our blueberry bush with an abundance of violet-blue berries and we spend many summer evenings dropping blueberries into buckets. Picking blueberries is a time for us to teach our kids about God and nature, and also for us to goof off and sing along to whatever songs are on Raleigh's Family Shuffle (it's a wide variety from Let It Go to the best of the 90's). This summer, the kids and I have turned these blueberries into jam, barbecue sauce, cobbler, galettes, muffins, and cake. I've really enjoyed learning more about baking with almond flour and natural sweeteners like maple syrup from the new cookbook by L.A. Baker Sweet Laurel. I'm also excited to have picked up the new Love & Lemons cookbook that is teaching me to cook more with vegetables. Our goal for our land is to plant more foods and flowers to produce a year-round harvest for our family and friends to enjoy. Baking has helped me to not only stop scrolling but learn how to use the delicious food that comes straight from our backyard. To keep myself from picking up the phone, I've spent a good amount of time snuggling with my four people and fur dogs. Ridley is the sweetest in the morning and evening when he crawls into my bed and scoots in close to me. I've also enjoyed taking him and our dog Lu Lu on a quick stroll around our neighborhood right before dusk. He feels special and Lu Lu gets out of the house and I am able to take a moment to breathe in the smells of freshly cut grass and we are all happy. I also really enjoyed spending some time at the beach this summer with just the twins. We had a great time finding Waldo in Rosemary Beach, eating at Great Southern, and just chilling in our beach chairs in the sand. Raleigh and I have also gotten a few moments to connect this summer and have truly enjoyed just doing nothing together whenever the kids have spent the night with their grandparents. One of the "projects" I was proud for us to complete is a new picture wall in our bedroom and I love to snuggle with him at night before bed and look at this wall. It's a reminder to me that family is truly a crazy beautiful gift and God's given me this guy to raise these children with and at the end of an exhausting day we can be proud that we haven't totally screwed them up and are doing okay. I knew I needed to take a break from social media because it was making me frustrated, insecure, and I was comparing myself to others. Taking time away this summer has reminded me that social media can be a source of fruit in my life. It allows me a way to stay connected to my friends, offer me encouragement, and inspire creativity in my soul. It's a place where, God permitting, I can provide light and peace to others. My sabbatical helped me find my focus for this next season of life and provided me time to heal. It simply gave me permission to rest and reminded me that God is not in a hurry but He is always on time in my life, and in yours. We find Jesus in the Sabbath because when we take time to enjoy this gift, we find restoration, healing, and satisfaction. Jesus assures us that the Sabbath was made for us so that we can know that we don't have to face our daily challenges alone. He is with us, will fight for us, will give us strength to face another day. Satan attacks us, constantly, through images, Instagram stories, and even when we are in the places we feel most safe, like our homes or a frequent vacation spot. Satan doesn't want us to feel rest or restoration, he is constantly trying to distract and divide our souls away from Jesus, the Lord of the Sabbath. Let us take back what has been rightfully given to us. May we find rest from our work and take time to pause from our busy lives so we can remember that our help comes from the Lord. Let's be Sabbath people. Question: How are you going to choose to receive the Sabbath this fall? I'd love to know and pray for you! p.s. - Invited is now available as an audiobook! To get your free copy in Audible, just fill out this form!